Teen drivers, particularly novice ones, are overrepresented in U.S. fatality and injury crash statistics, where one out of every five young drivers in the nation is involved in a crash within the first six months of driving. Early during her tenure at the transportation institute, Klauer worked on the completion of the 100-Car Naturalistic Driving Study—the first large-scale study of its kind and a project she considers a highlight in her career. The naturalistic driving study method, pioneered at the Virginia Tech Transportation Institute, involves instrumenting volunteer participants’ vehicles with unobtrusive cameras, radars, and sensors that collect real-world driver performance and behavior. Afterwards, Klauer led the Naturalistic Teenage Driving Study that was sponsored by the National Institutes of Child Health and Human Development. The study was the first of its kind to investigate the risks faced by teen drivers during the first few months after receiving their licenses. Klauer and her team found that, compared to adults, novice teen drivers are involved in four times more crash and near-crash events during the first 18 months of licensure. As a result of the study, her group has published more than 15 related journal articles, including an article published in the New England Journal of Medicine that compared the driving behavior and performance of adult drivers in the 100-Car Naturalistic Driving Study with results from the Naturalistic Teenage Driving Study. The national impact of the journal article was almost immediate, with the article named among the Top 100 most-discussed academic papers in 2014 and among the Top 15 most-read of more than 10,000 studies published by the New England Journal of Medicine. The Teen Risk and Injury Prevention Group has since conducted several other teen naturalistic driving studies, including the Supervised Practice Driving Study—an ongoing study during which continuous naturalistic driving data were collected from 90 novice teen drivers during the first nine months of the learner’s permit phase through 12 months of independent driving—and the Driver Coach Study. The latter involves 92 newly licensed teen drivers who receive real-time feedback when a risky driving event is detected by an advanced data collection system; the teen’s parents/guardians then receive post hoc feedback. Preliminary results from this study indicate that if parents are engaged and review the feedback website, teen crash/near-crash rates are lower than if parents do not review the feedback website. Today, the Teen Risk and Injury Prevention Group has developed the Teen Naturalistic Meta-Database, comprising previous teen naturalistic driving studies conducted at the transportation institute along with teen drivers within the Second Strategic Highway Research Program Naturalistic Driving Study—the largest light-vehicle naturalistic driving study ever conducted and involving more than 3,500 drivers aged 16 to 98. Collectively, the meta-database covers 380 16- and 17-year-old drivers, 12 to 24 months of continuous driving data per teen, 321 crashes and 675 near-crashes, and more than 700,000 trips and 200,000 hours traveled. 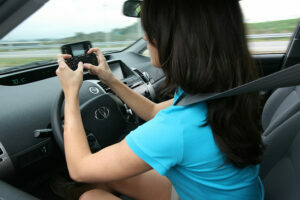 The group will use the meta-database to further inform the understanding of teen driver risks on an even larger scale. Beyond her research, Klauer and her team work with the community to prevent distracted driving within the teen driver population. The group has spoken at high schools to parents and teenagers, educating them about the dangers of distracted driving. The team has also partnered with groups such as the Blue Ridge Transportation Safety Board to continue educating the public about driving risks faced by people of all ages. After being asked to speak at a Bedford County Parent and Teen Night in response to five teen fatalities in 10 days, the team also began developing materials for licensing ceremonies in Virginia. In addition to teen distracted driving research, Klauer is working on reducing crashes related to driver distraction within the overall transportation community and within novice driver populations that are known to have higher crash risks, such as teenagers diagnosed with ADHD. “Distracting activities performed while driving are often overlooked risks, and we need to remain diligent as the impact of mobile devices in vehicles is increasing exponentially – not only in the number of smart phones owned but also in the number of applications that young drivers and adult drivers use while driving,” said Klauer. Klauer is currently working on securing funding to better evaluate a broad range of monitoring and feedback systems designed for teen drivers. By conducting work such as increasing parental involvement, she hopes to continue to reduce crash risk for teen drivers. Senior design team members Kristine Adriano, Daniel Carrasco, Andrew Pitt, Wayne Carter, Brian Smith, and Sean Gardner pose with a bumper designed to limit damage to vehicles under-riding the back of tractor trailers. A Virginia Tech mechanical engineering senior design team, advised by Jared Bryson of the Virginia Tech Transportation Institute and Professor Robin Ott, will be presenting their work at the Insurance Institute for Highway Safety Roundtable on May 5. 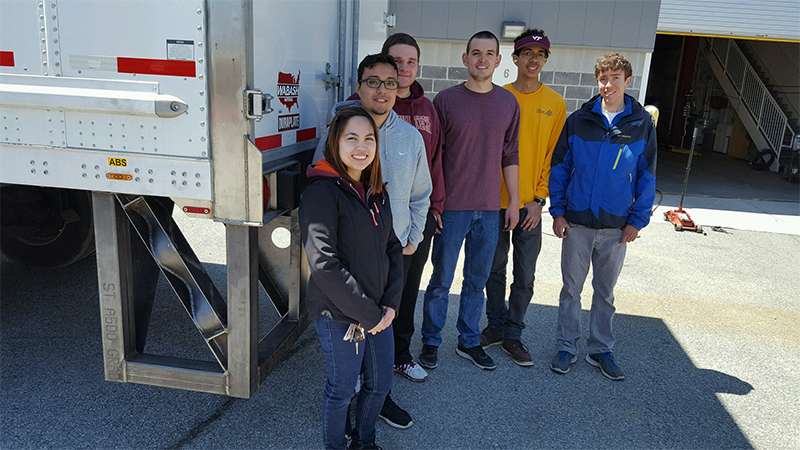 The student team members – Wayne Carter, Daniel Carrasco, Andrew Pitt, Sean Gardner, Kristine Adriano, and Brian Smith – designed a bumper to limit damage to vehicles under-riding the back of tractor trailers. According to Carter, the team facilitator, the goal of the bumper is to maintain the overlap protection in current bumper designs while improving to 30 and 50 percent overlap collision protection. Overlap refers to the percentage of the front bumper of the impacting car that strikes the rear bumper of the tractor trailer. The bumper is also designed to absorb energy to lessen the deceleration experienced by the driver in the event of a collision. The design team began by consulting with Bryson to understand customer needs and product expectations. The team then generated several concepts and continued to narrow them down to a final design. After unveiling their final design to Bryson, the team made adjustments, generated drawings, and contacted metal working companies to fabricate their bumper. In addition to the Insurance Institute for Highway Safety Roundtable, the team will be judged alongside 44 other mechanical engineering undergraduate teams at an exposition in Squires Student Center on April 29, when projects will be on display at 1 p.m. at the Squires Student Center Commonwealth Ballroom. As far as sources of renewable energy are concerned, poop would seem a likely candidate as a never-ending supply of fuel. But it turns out wastewater energy plants stink at maximizing their energy output in a sustainable way. Nationally, treatment plants consume 5 percent of the country’s total output, but that could be significantly reduced if the plants could harvest the energy from the waste that people flush down their drain pipes every minute of every day. Two Virginia Tech researchers have discovered a way to harness the energy from wastewater using two distinct methodologies: using a novel tracing technology to determine which bacteria work well together to chew through waste, and also which ones are good conductors of energy. Xueyang Feng and Jason He traced bacteria, which led them to discover that the working relationship between two specific substrates produced more energy than either did separately. This work will help take the mystery out of how electrochemically active bacteria create energy. It could help in the development of new treatment system called a microbial fuel cell. Harnessing energy from wastewater is a sustainability measure that even urban plants such as the wastewater treatment facilities in Washington, D.C.
For now, however, Feng and He are not only giving wastewater it’s moment in the sun, they are making sure that, whether it’s ammonia or organic waste, that producing energy from wastewater is part of a movement. Watch a video here about He and Feng’s discovery.